On August 28th, New Bloom’s Brian Hioe interviewed Liu Hui-Min from the Green Citizen’s Action Alliance (綠色公民行動聯盟) regarding environmentalism, the anti-nuclear movement in Taiwan, and Taiwanese activism writ large. This is the second of a series of interview profiles that New Bloom will be doing with Taiwanese NGOs and civil society organizations, in an effort to present a picture of Taiwanese civil society to an international audience. Brian Hioe: My first question is how did Green Citizens’ Action Alliance (綠色公民行動聯盟/GCAA) start concerning itself with social issues as nuclear energy and environmentalism? What activities did you begin with when you first started out? 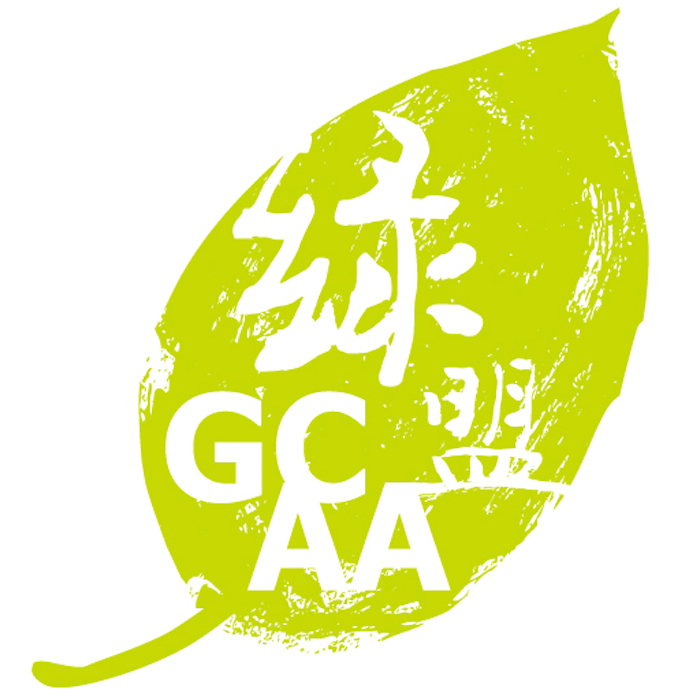 Liu Hui-Min: GCAA is an environmentalist organization. 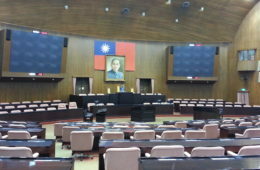 Twenty or so years ago, we were part of the Taiwan Environmental Protection Union (台灣環境保護聯盟/TEPU), as its Taipei Branch. Do you know TEPU? BH: I don’t in fact. 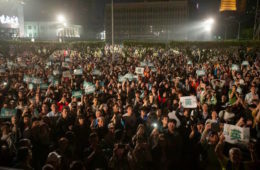 LHM: So many years ago, when the Taiwanese environmental movement picked up, quite a few environmentalist organizations formed. The earliest was the TEPU. In each location, the organizations that came to be, were not directly part of TEPU. At that time, we all named ourselves after the TEPU because this was early on in the environmentalist movement, but though we were called TEPU, Taipei branch, we didn’t have a direct connection to TEPU. 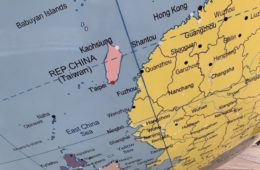 The issues we concerned ourselves with were those of greater Taipei, including Reactor #4 in Gongliao, and Reactors #2 and #3, which are also in northern Taiwan. 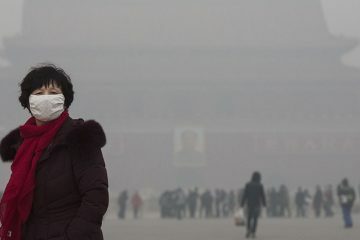 In addition to nuclear energy, we also concerned ourselves with wasteland, air pollution, and sea contamination. In 2000, as the activities we did became clearer and clearer, we became more distinct from TEPU, because everyone was doing their own thing, and it was more apparent to us the things we wanted to do. So we changed our name to GCAA. It’s quite a long name, actually, but the “Citizens’ Action” aspect was very important to us. We then placed the importance upon the anti-nuclear movement, that is nuclear energy policy, air pollution, pollution of rivers and creeks, and broader issues of the management of natural resources. Probably these are the big aspects. 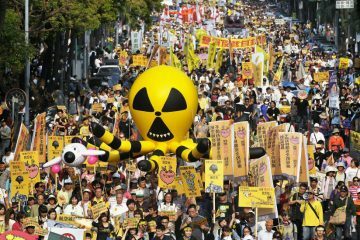 In 2011, with the Fukushima incident on March 11th, 2011, we decided for these few years, we should emphasize the anti-nuclear movement, because Reactor #4 had been protested already for ten, twenty plus years. With Fukushima raising a great deal of awareness about nuclear energy, we thought these few years would be a key point for the anti-nuclear movement, so ninety or so percent of our energy was spent on the anti-nuclear movement from then on. From 2011, with other organizations from April 2011 onwards, we’ve put together large activities regarding the issue of nuclear energy. You said earlier you were living in Taipei last year? You might have seen our activities. BH: Yes. I saw the Zero Nuke Festival, which you organized in the Fall. Can you explain the goals behind some of the activities you organize, then? Such as the Zero Nuke Festival or other activities? LHM: In the anti-nuclear movement, apart from lobbying, or protesting on the streets, we also work on a lot of social education initiatives. 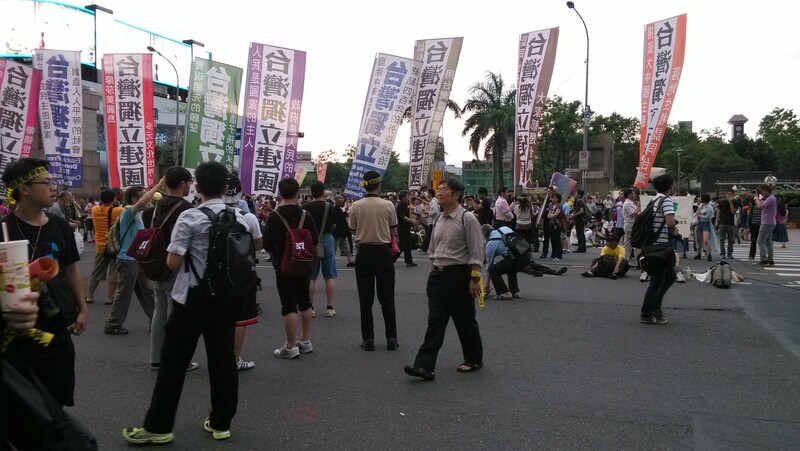 From March 11, 2011 onwards, Taiwan’s resources and strength has been placed upon the anti-nuclear movement. We’ve done some purpose training, putting together experts from different domains to speak about their fields of expertise. Or organizing discussions in different places; whether it is a coffee shop, somebody’s living room, or a school, we can discuss nuclear energy and different things concerning nuclear energy there. This has provided a foundation for our activity. 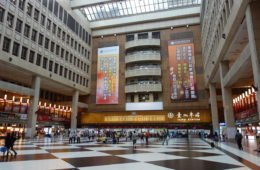 Of course, you might have noticed it as well in Taiwan, but people concerned with culture, as in movies or music, are very much interested in environmentalism as well. That’s been another basis of activity. 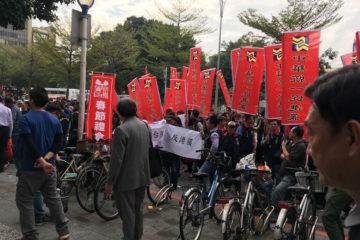 With growth over time, our protest on March 9th of this year drew 220,000 onto the streets, but the KMT government suggested the referendum as the way to address the issue. You know the issue? The number of votes for there to be a public referendum to be held to begin with needed is restrictively high and the way the voting questions are set up is problematic. 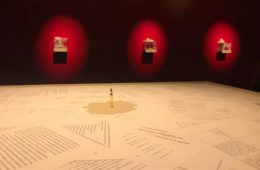 But while to a certain degree, we use oppositional methods to address problems, such as protest, we’re also prepared to use more responsive methods. We discussed social education previously, but we also seek to take on activities which organize Taiwanese neighborhoods more deeply. For example, we work Taiwanese illustrators who make art about the nuclear issue. We decided to put together an exhibition with artworks from them and we also decided to also screen multiple films regarding nuclear energy. Through these kinds of methods, we can have more opportunities to go to different neighborhoods; by using our original social education initiatives, we can do much raising of awareness. Many people still don’t understand nuclear energy’s problems, because of the country’s propaganda. And sometimes people don’t really understand resource problems, lack of electricity, and problems of our proportion of nuclear energy usage. BH: Regarding Taiwanese society, what problems do you think you need to overcome? We discussed how people view nuclear energy. Like you said you’ve mentioned social education is something GCAA pursues, but people don’t always understand. What is it that people don’t know enough about? Is lack of information the hardest thing? LHM: Is it the hardest? I think, yes…but there are many aspects that are difficult. Nuclear energy is too closely related to politics. Sometimes the question of whether we need nuclear energy is related to politics too much. But we believe there has to be bottom-up change in the current situation. So we need citizen’s education, or spreading awareness. We believe this is the foundation of social movements. It’s hard to confront mainstream media and politics or education in the mainstream, they have control of public education and the media, so there are many things which are hard. And nuclear energy is a complicated problem. Maybe things are difficult to communicate through the media in order to effect change. It’s a tough question. But I want to say, in regards to GCAA, we believe in bottom-up change, so we won’t give up on any measure. Just that for these few years, we have a lot of participation but many people say that “I’m opposed to Reactor #4, I’m not opposed to nuclear energy as a whole.” But I feel that the biggest problem is the fundamental issues of nuclear energy and that it’s not good for the environment and negatively affects people’s health. It is these kind of people who say these kind of things that we need to convince. BH: What would you say about the current state of the anti-nuclear movement after Lin Yi-Hsiung’s hunger strike? There aren’t as much people on the streets now. 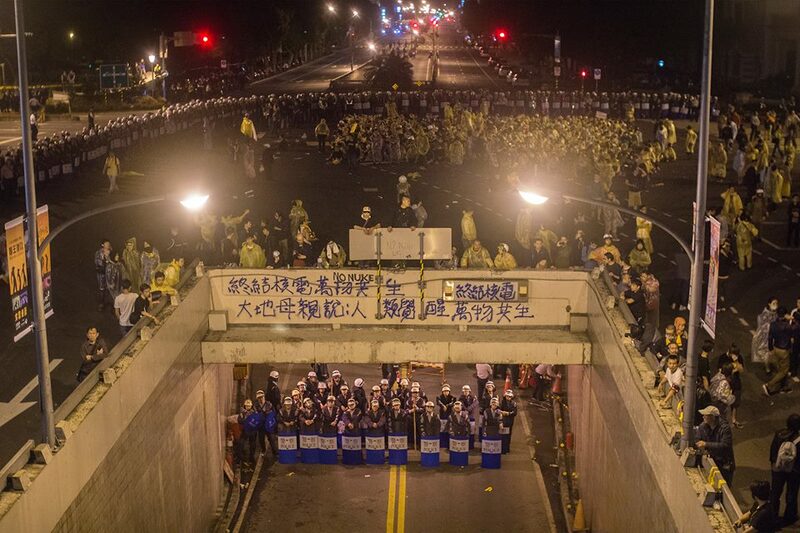 Maybe the past year is the most there have been protesting nuclear energy in a long time, but in the present in Taiwan, what needs to be done? LHM: There are a lot of places we need to affect, including what we discussed earlier. We work together with other organizations to try and affect the referendum, because it’s very clear: the current referendum system is not democratic. It doesn’t allow for the expression of the people’s will. BH: Can you we also talk about problems you might have had from the government? Because we discussed the Zero Nuke Festival, in which you faced problems from the police taking issue with the legal basis of holding the film festival. LHM: I think what’s very clear in Taiwan is that though it seems like Taiwan has become a democratic country from this point on, what we continue to encounter are the same problems. During Martial Law, we would have been suppressed, to be sure. But we haven’t encountered this kind of problem before. The people we worked with to put together the photo exhibition at the Zero Nuke Festival, though they’ve organized these kinds of events many times, they’ve never encountered this before. So we were singled out this time. The past few years, similar problems have begun to appear. For example, I don’t know if you’ve noticed the Green Party. They wanted to have a big public meeting, gathering together all their candidates, and to hold a public discussion. That was at Huashan but on the last day, it was suddenly cancelled. We often say that with big things, it should have been stopped long ago, and much environmental problems should have been resolved long ago, but the government uses these small articles of the laws to halt social movements. BH: You say it’s fundamentally a question of democracy. LHM: I think towards democracy, we haven’t gone far enough towards establishing it. I think more severe is during the Executive Yuan incident on March 23rd, or the April 27th protest which brought out 200,000, we were attacked by the police with water cannons on Zhongxiao East Road. The government doesn’t address democracy or the question of rule of law but uses their so-called rule of law to attack us. BH: Can we discuss your cooperation with other groups? How would explain you explain your cooperation or your role among all these groups? Since Taiwan has so many groups, what do you particularly do, I mean. LHM: I think we can split it into two aspects. 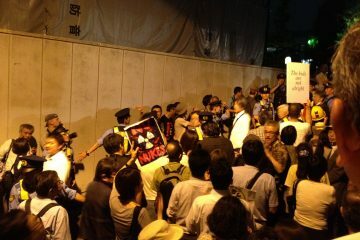 One is still the anti-nuclear movement. For example, each environmentalist group concerns itself with nuclear energy, and as in the past, with anti-nuclear activities, there are still many environmentalist groups participating. But these few years, we’ve had some concrete achievements in the past few years in building coalitions. For example, we formed 全國廢核行動平台 (“All-Country Anti-Nuclear Movement Platform”). I don’t know if you’ve noticed, after the March 9th protest, we put together all these different groups to put together this alliance. 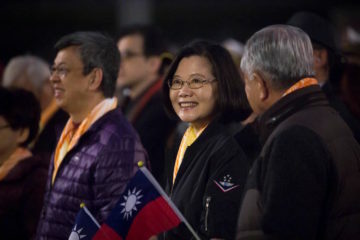 Over one hundred groups have joined, with groups from the north, central, and south of Taiwan. We’re the main group in the north. I think these things build a more sustainable foundation for the anti-nuclear movement. With this kind of work, building coalitions and working with different groups, you have better results. Including this year’s. 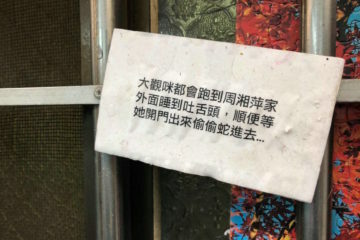 March 9th protest or our activities in April during Lin Yi-Hsiung’s hunger strike, we’ve established something like a cooperative spirit between anti-nuclear groups. Otherwise there would be no way that in a short two months, we could put together two large-scale protests. BH: What are the groups you cooperate with outside of anti-nuclear groups? LHM: We have worked with pro-Taiwanese independence groups, some of which we’ve worked with for many years. Every year on Fulong Beach, near Gongliao Reactor, there’s a music festival. 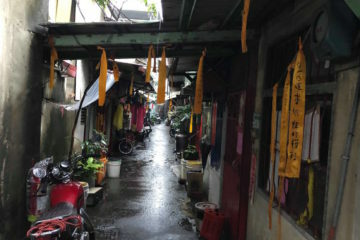 Before 2011, when the anti-nuclear movement hadn’t taken off as it has recently, we spent much energy trying to organize within the neighborhood area of Gongliao. The retreat of Fulong Beach’s shore because of the reactor construction is increasingly visible, so there is very visible environment damage. We would always set up a tent there everywhere to discuss this question. Or distributing materials to answer questions. Pro-independence groups would attend the music festival every year and became aware of our activities, so more and more people began to pay attention to effect of nuclear energy on the sealife, fishery, etc. We also work with other social issue groups. 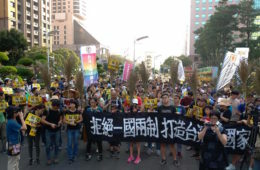 Among Taiwanese environmentalist groups, I feel we are quite particular because within our staff, we also people who have participated in the labor movement, regarding land issues, sexuality, and the aboriginal movement. 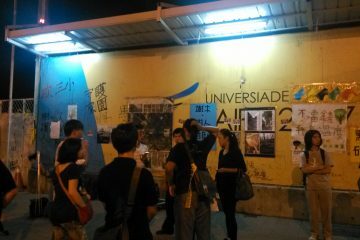 For example, we talked about the Legislative Yuan occupation. We were always opposed to black box and free trade. We were there from the beginning and the afternoon during the occupation. 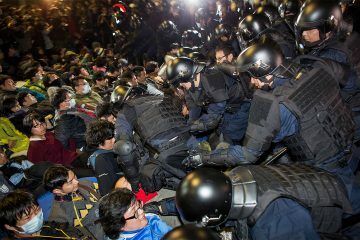 When the occupation went down at night, when the occupation happened, we and other NGOs, why we could organize the encampment the outside of the Legislative Yuan so quickly is because of these accumulated connections between groups organizing around of social issues and because of social movements. During the large-scale protest on March 30th, a lot of NGOs were working together. 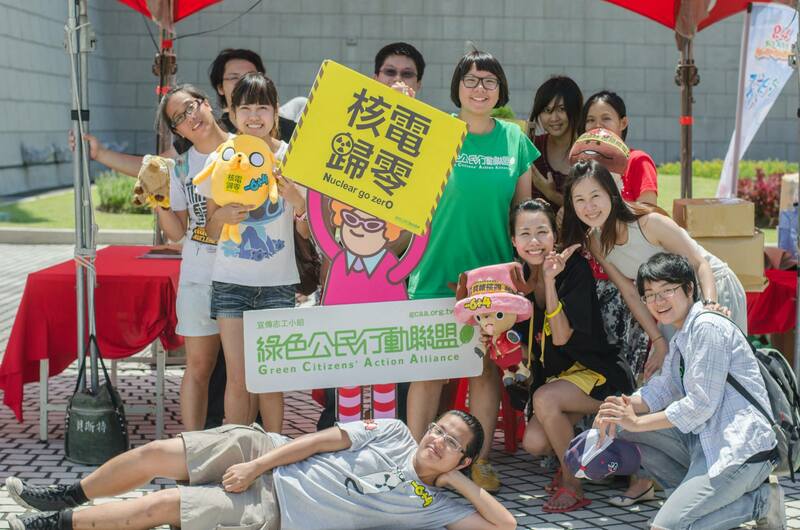 All of the groups of 全國廢核行動平台(“All-Country Anti-Nuclear Movement Platform”), such GCAA and Citizens of the Earth, Taiwan (地球公民基金會) were. 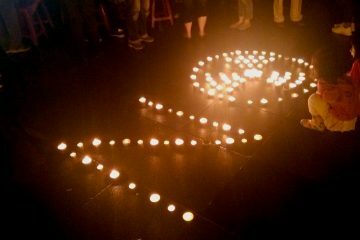 Because of the experience from the anti-nuclear movement, we could prepare very quickly. As things go on and every time an incident happens, it allows different organizations to better know each other and better cooperate. BH: What would you count as success in GCAA? 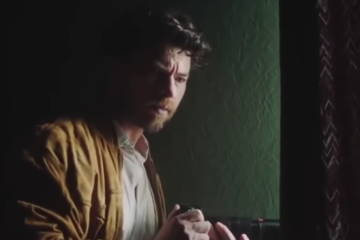 Or what you need to improve on more? And what’s the next step for GCAA? LHM: It’s hard to say what is success. It’s hard to discuss. 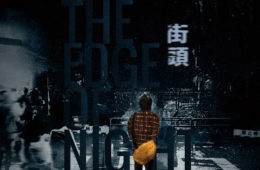 Because I just think from the perspectives of ten years, the anti-nuclear movement in Taiwan has been fighting very hard recently, but from the perspective of the past two or three decades, this is just a temporary high point. In the longer term, something the Dangwai movement or the democracy movement also gave the anti-nuclear movement great inspiration, too. I think we should say there’s many issues we should pursue. First, I hope we would have more resources and ability to do more of the things we want to do. But would also want to establish global connections. I went to Australia recently to talk to Australian anti-nuclear groups. Why did I want to go to Australia? Because we have the hope of connecting anti-nuclear movement across the world in all aspects, including research, and working with other anti-nuclear movement people in other countries. Our co-worker went to North Europe recently to see how they deal with problems of nuclear waste disposal, for example. And the president of GCAA went to Japan, because Japan may restart their nuclear reactors soon and this has led to a lot of protest. These protests are reported very little in Taiwan, so we go to present on our own work, and bring news of what happens abroad back to Taiwan. But we need a lot of resources for this. To go to Australia and North Europe, last year, we applied for a foundational grant in order to accomplish this. 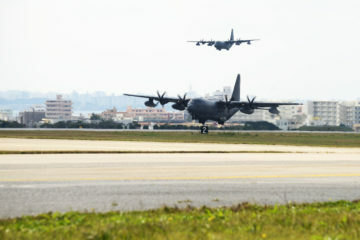 And to go to Japan, it was only with the financial support of Japanese organizations that we could achieve this. 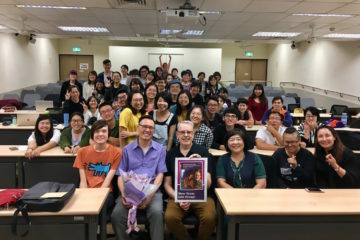 But, yes, if we had more resources and more manpower, we could do these things better and do more, in terms spreading awareness, or for connecting things between Taiwanese social movements. BH: The last thing I want to ask is for an international reader who may not understand Taiwan’s situation, what would you say? In the end, like what is very particular to Taiwan. LHM: This time when we went to Australia, we discussed the anti-nuclear movement with Australian anti-nuclear activists, including that we had 200,000 people on the streets protesting nuclear power in recent memory. Or that you can see the anti-nuclear flag everywhere now, on big streets or small streets. When we mentioned this to them, they were rather shocked to hear this, because everyone’s situational context is different. Australia has much land, you might now be able to see issues of nuclear energy so clearly, for an average person. As for us, our land is small, the issue of Nuclear Reactor #4 is very prominent and nuclear disposal sites are also close to us geographically. So I think our movement process is to be proud of. Despite these things in the back in Australia, it was supposed to be us interviewing them, and then it became them interviewing us. 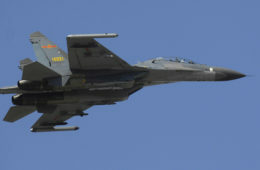 It can remind us that the anti-nuclear movements in our country can influence other countries. The second is, it’s a worldwide issue. Why do we have so many countries using nuclear power, or serving as nuclear waste disposal sites, where their people and land facing the same problem? And it’s not just nuclear energy, but other environmental issues. We also did exchanges with Chinese NGOs in the past year. Between the two sides, the situation will probably become more similar in the future. I mean, land, the earth, it’s all connected and we can bring this out through social movements. All people should stand together. Our problems are all connected, so to make change, it can’t just be changing one country at a time.